Though there are a number of ways in which we can think of home – a particular building, a geographical location, a group of people – at heart they are all about belonging and identity. Ming-Mei is no longer Ming-Mei. Sent by her parents to the Lushan Missionary school, she becomes Henrietta (Etta) S Robertson. She is encouraged not to speak Chinese while she learns to become what her parents, what she, hopes one day to be: a good missionary. It is 1941. As rumours of war circle the mountain, ten-year-old Etta feels her dislocation. Scared of becoming the gui-mei, the ‘ghost-girl’ the women her mother used to preach to would call her, sunk in the mists and mysticism of the mountain, Etta may have experienced a prophecy. As the shifting whims of childhood are tested in ways the children of Lushan School could not have foreseen, things start to unravel. In A Land Of Paper Gods evokes a child’s eye view of life in a boarding school for the children of Missionary Workers in China. Rebecca Mackenzie weaves these two cultures, the struggle for understanding and purpose in an isolated world, the uncertainty of war that bleeds into the children’s consciousness into an airy and atmospheric story, as encompassing and disconcerting as a descending mountain mist. But both Etta and Aunty Muriel, Etta’s Dormitory Teacher and occasional narrator, are beacons to guide us. It’s an easy thing to sneer at an ideology you don’t believe in. It’s an easy thing to present a belief that appears tawdry and leaves the character looking foolish or deluded. Not so with Etta. Etta’s faith fits her perfectly. It’s a child-like belief rooted in her earliest memories. And it sways and wavers like the tallest mountain pine. Her voice is wonderful. From the off she is a child you feel you want to know and, for me, remained a person I both felt and rooted for throughout (make no mistake, this is a very emotional book). Indeed, the characterisation throughout the novel is excellent, but particularly for the girls who surround Etta. They are diverse and consistent, almost visible they are so well-drawn. That sense of belonging takes on wider connotations with the actions of the Prophetess Club, the group of school-friends she surrounds herself with. There’s that fundamental belief in the good of what they’re doing but there’s the fallout, too. The old conflict between perceived benefit and incidental harm inherent in mission work subtly laid out. Coming-of-age stories are not rare in fiction. Stories like In A Land Of Paper Gods are somewhat thinner on the ground. I would not have guessed the journey Etta and her friends go on at the start of the book. I like a book that leaves me thinking beyond the last page, and in that respect Rebecca MacKenzie doesn’t disappoint. The ending is perfectly weighted. Etta is a superbly-drawn character; true to her nature throughout, though very different from when she began by the end. She is cheeky and funny. She is self-absorbed and self-possessed. She will make you laugh and she will make you hold your breath. Her story will likely make you cry. It’s a book that will stay with you. It’s a book that has the power to wring your soul. My thanks to BookBridgr, and Ella Bowman at Headline for allowing me to review this book. 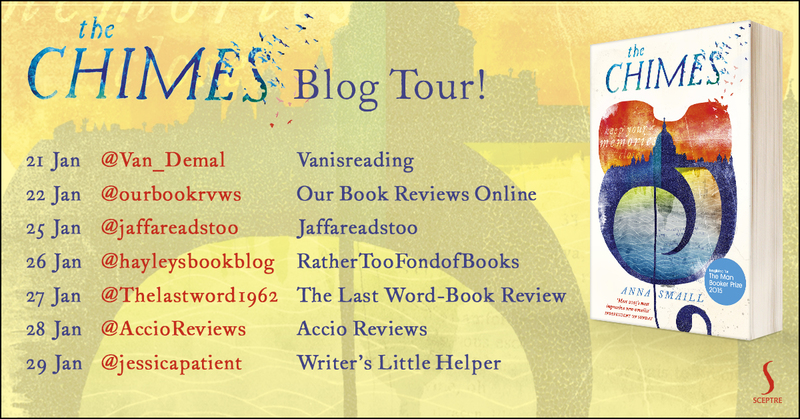 Tags: "book review", "book reviews", "In A Land Of Paper Gods", "Paper Gods", "Rebecca Mackenzie", "reviews", "Van Demal"
I’m delighted to welcome you to the first stop on the Blog Tour for Anna Smaill’s The Chimes, published in paperback by Sceptre on the 14th of January 2016. It’s a terrific book (of which you can read my review here) which raised many questions in me, and I’m very glad to say that I was able to pose some of those questions to Anna. While reading The Chimes I was strongly reminded of Herman Hesse’s The Glass Bead Game, not only in the reverence you give to music in the story but also in the simple language Simon uses to tell his story. Who are your touchstones in writing – those you admire, those who inspire you, those whose books you go back to? I think you may be the first reviewer to spot that connection. The Glass Bead Game made a big impression on me when I first read it as a teenager (probably the perfect time to read Hesse), and it was continually in the back of my mind while I was writing The Chimes. The concept of an intellectual elite whose philosophy and ethics are structured by music was essentially lifted from Hesse’s novel, though of course The Chimes is also very different. The writers I most admire are those for whom writing is some kind of essential mediating device, a way of decoding or just surviving existence. I love Janet Frame, Russell Hoban, Kafka, Borges, Marilynne Robinson, the NZ novelist Pip Adam. I also often re-read read George Eliot, Ondaatje. I find myself continually shaped and inspired by my favourite books from childhood, too. Particular favourites are Rosemary Sutcliffe, K. M. Peyton and the Uncle books. Yes, since I can remember. I’ve kept journals since I was about 9 or ten. It’s really very much how I work out what I think about things. The scene between Simon and Steppan brings home the chilling reality of a world without memory. Simon feels balanced between feral and humane. Why did you focus on memory? I think I’m so focused on memory because it seems so close to the core of what makes us human. For some reason the idea of losing memory has terrified and fascinated me from quite a young age. Trying to make sense of your memories, putting them together in a way that seems meaningful – I don’t take this for granted in any way. You take the idea of music as a means of communication to an extraordinary level in The Chimes. What was the seed of this idea and how did it develop into the world you created? It’s hard to pinpoint exactly where the idea came from. When I was playing the violin, I got a bit obsessed with thinking about the differences between music and language as two different forms of communication, and was always seeking direct equivalencies between the two. Of course, they can’t be reconciled in this way. There were other elements there too. I had an utterly eccentric music theory teacher when I was at university, who liked to expound on a methodology of his called ‘Body Tonics’. His basic argument was that chord progressions in a piece of music could be matched with physical movements, and that if we enacted these movements while listening to the music, we’d gain some deeper musical insight. I may be bastardising his theory. It was basically a sol-fa technique (the thing the Von Trapp children do while running around in the mountains) that engaged one’s whole body. So, there was that, and also Chatwin’s book The Songlines, which is about how aboriginal Australians ‘sung’ their sense of landscape into being, so that all physical markers – rock formations, valleys, lakes, etc – can in turn act as a kind mnemonic device for their creation myth. All of these things coalesced somehow. I’d like to ask about Jemima. Though she only appears for a short while you portray her in quite a touching way and she presents an interesting counter to Lucien. The question of course is that posed by Simon. Is she immune to the effect of Chimes? I enjoyed writing Jemima because she’s nicely practical and pragmatic – which offered a bit of a relief from the intensity and idealism of Simon and Lucien. She seems older than them, in a way; more worldly. In some ways I didn’t want to examine Simon’s question too far. In a practical sense, she’s still affected by Chimes because they involve infrasound – vibrations that are inaudible but affect you physically at the level of your nervous system. However, I liked to think that because her awareness and communication isn’t directly reliant on music, her mind and consciousness is different – she’s developed different ways of thinking and remembering. I found the Order intriguing. With their presenting and reinforcing of ‘OneStory’ they seemed to me somewhere between a religious parallel and a political one. Were you conscious of creating them in either a religious or political mould, or did you strive to avoid those direct associations? I wasn’t striving either to cultivate or avoid those specific associations. I guess, it’s more that political or religious extremism was simply another arm of the sort of extremism I hoped to represent with the Order. I was interested in what happens when we take idealism to an outer limit. How does that pursuit allow for the ordinary mess of human lives, and the human impulses that can’t be tidied or understood? The Order obsessively believe that human expression, and human thought, is our highest function – which means that all that isn’t perfect, or orderly, has to be expunged. I think this impulse is fairly similar in much religious thought, that sense that the body is a threat to the spirit. They’re very basic and central human impulses, but they become destructive when they’re taken to an extreme. There’s something very close to fairy tale in what you present in The Chimes: a band of outsiders and a governing organisation, the uncovering of clues and the overcoming of obstacles, and the passing down of a tale in rhymes. There’s even an aged mad woman. Were you aware early in the writing process that you wanted this reflection of the importance of oral history or did this develop as the story came together? I started writing The Chimes very much under the influence of the young adult literature that moved and interested me. A lot of the radical freedom of excellent fantasy and YA is that, maybe because it isn’t weighed down with the responsibilities of realist representativeness, it can really cut to the fundamentals, the verities – love, loyalty, the struggle for meaning. Those mythic rhythms and emotional chimes are ones I also find in fairy tales, myths, stories which tell us something simple and deep about being human. I suppose I was striving for and craving that sort of deep resonance in what I was writing. I had just finished a PhD on contemporary poetry, and most of my previous days had been filled with dense academic language! Your choice for The Pale Lady is a very good fit but I wonder whether you began with scientific reasons for the choice, practical reasons around availability or whether the word play led you there? There’s something a little ‘overnight sensation’ about debut novels and the way they’re marketed (though with a Man Booker longlisting, and having read The Chimes it’s the overnight bit that to my mind is the false note). How long did it take from first putting pen to paper to publication? What’s the best editorial advice you had for this book? Yes, I agree – there tends to be a fascination with that breakthrough moment. I think in part, it’s fair. There is something distinct and utterly unusual about first novels: they involve so much of your life, they’re a kind of leap into the unknown, a massive and intriguing gamble, and they can utterly turn your life around. But these are all narratives that don’t ultimately connect with the nitty gritty facts of writing. The first glimmers of The Chimes came way back in 2009, while I was finishing my PhD. I didn’t acknowledge that I was working on a novel, though, until 2010. In 2011 my daughter was born and any semblance of a writing routine flew away and then I only returned to proper routine work on it early in 2013. With two days a week to write, I finished in about 4 months. It had a long long gestation, but a very fast delivery. Then the editorial and pre-production of debut novels is typically quite slow, as they want to spend a decent length of time on publicity and marketing prior to the release. And now it’s 2016, a terrifying number of years later, and the paperback is coming out! I had so much excellent editorial advice with this novel. My agent Will was one of my first readers, and just prior to submission he dropped a particular gem about how one might go about sustaining uncertainty in the reader. The beginning of my book is essentially a cloud of vagueness, but he made the important point that I had to distinguish between the general mystery of the opening (ie – the facts of the world that were simply yet to be revealed to the reader) and the things that were weird or perplexing to the protagonist. It sounds simple, but it really transformed how I thought about the opening sections. What does the future hold for your readers, can you tell me anything about what you’re working on next? I’m working on a new novel, which feels in many ways utterly different from The Chimes. It’s set in a contemporary, far more familiar and realist Tokyo. But, I can’t quit that drive toward the fantastic, so the city is becoming denser and odder as I write. There is also music creeping in as a method of plotting the story (I won’t give away too much), and elements of a thriller also. It’s not in keeping with the universe of The Chimes (where they’d have been burnt long ago), but I’d probably take my journals. They all have different associations, depending on where I bought them, the paper, the pens I used, so that even if I couldn’t read them, I think there’d be sensory memories there. I think, a bit embarrassingly, I’d probably take my old Burberry trench coat. I lent it to Simon for the novel, but I had it first! Bought off Ebay before my daughter was born, and my single most-worn item of clothing ever. There are plenty of memories in that homely old gabardine. My thanks to Anna for making my questions look insightful (and for adding a few more names to the TBR pile), and my congratulations for writing such a wonderful book. I feel it will be with me for quite some time! Thanks also to Ruby at Hodder for making this Q & A possible. Don’t forget to check in with the other stops on the blog tour. And, of course, don’t forget to read the book! Tags: "Anna Smaill", "blog tour", "Q & A", "Q&A", "The Chimes", "Van Demal", "vanisreading"
The end of term two of the Curtis Brown Book Group brings us Julia Forster’s What A Way to Go. Twelve-year-old Harper Richardson is navigating life, cuddling gerbils, managing her divorced parents and avoiding baked beans. And as it’s 1988, she never misses the Radio 1 Top 40 show, she barters down the price of a shell-suit at the local market and she rushes to check the second post before Mum. Second post – can you imagine! It’s a heart-warming story that is sometimes funny, sometimes sad, always true to its time. I wanted to connect with Harper more strongly than I did but something held me off (maybe the Chambers dictionary, I never would’ve trusted a twelve-year-old with a dictionary). She’s a funny kid in her way, and she’s feisty, though not overly-so. And Thank Morten Harkett, she’s sensible enough to know what’s good for her parents and that might not be each other. In fact it was in those more desperate moments that I felt for her, and felt closer to her. It didn’t bring a tear to my eye – though it was close a couple of times – and I think that’s all about that early impression. In essence this is how we judge a book, any book: how connected to the characters did I feel? For me, there’s something in Harper’s humour that held me off. The cast are well-drawn and varied and I suspect recognisable to anyone old enough to remember. Although it’s Harper’s view of the world I think I took to Derek most of all and I’m now looking forward (Julia, hint-hint) to Derek’s Early-Nineties Vidal Adventure. People dis the 80’s. They dis the 80’s now in the way they used to dis the 70’s, which condenses the decade down to the awful fashion and the awful music. Through Harper’s eyes I’ve seen enough to concede that, at least as far as the fashion goes, the 80’s had sufficient man-made fibres to be terrible. But there was some great music in the 80’s. Okay, so not much of it surfaces in Julia Forster’s What A Way To Go (The Primitives, Adam Ant) but that’s true to form. It’s in looking back that we often find the gems nestled among the every-day. And what else would a twelve-year-old have done than imbibe the catechism that was the Sunday night chart run-down, for better or for worse (the latter, obvs). As to the fashion, Harper has a forensic eye for her mum’s night-out wardrobe in all its terrifying glory. There’s that undercurrent too, suitably subtle, bearing in mind we’re living through a twelve-year-old, of the teeth of Thatcherism really starting to tear the flesh. The bank manager is a necessary enemy, the landlord is Ming The Merciless and all Mary needs is a plan that will work. That desperation was real enough then and it comes through all too clearly in the novel. I didn’t feel it to the extent of the book jacket superlatives but Julia Forster’s What a Way To Go is funny and touching and sad. It has a great cast and an engaging story with enough turns to make you feel the breadth of Harper’s journey. Tags: "book review", "Books", "Julia Forster", "review", "What A Way To Go"
I got that tingle. In the way even the first paragraph immerses you in Simon’s world, how before we know his name we feel his abandoned state. I got that tingle and already I was thinking about Margaret Atwood’s Oryx And Crake (you know how much I love the opening of that book, right?). By the time I reached the end of the first chapter that tingle had turned into a very big grin. 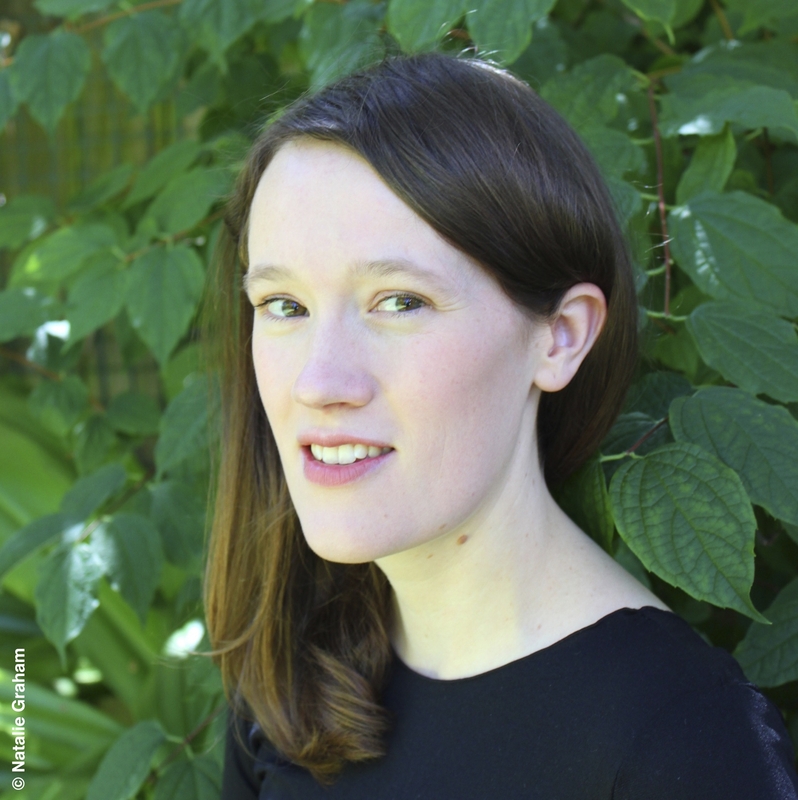 Anna Smaill leaves you in no doubt about the sense of fear that haunts this world. 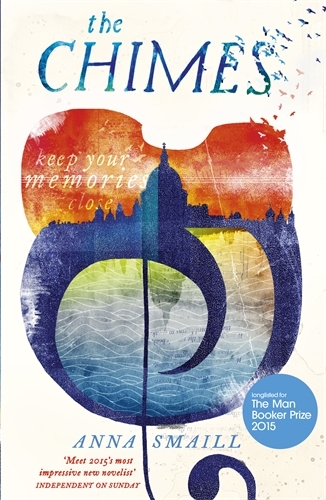 ‘Keep your memories close,’ Simon is warned, and he knows only too well how lost he’d be without the meagre contents of his roughcloth bag – his objectmemories. Anna Smaill leads us through the fragments of Simon’s days, gradually building our view of his world and how it works, inviting us in as Simon finds his place and discovers a purpose buried in the fragments of his recollection. Memory is so linked with how we function, how our world works – who can’t inexplicably recall advertising jingles from when they were kids? And how frustrating it is when we forget something, or when there’s a name on the tip of the tongue that refuses to be grasped. Mrs Van asked me if I remembered a particular place the other day and I found myself examining the process of trying to remember: an initial concentration; then zooming out, thinking about the locality and what I could remember nearby, actively recalling driving there and building a more precise image. What if every day was a slate wiped clean? What if you had to choose your memories, decide which are the important moments as they happen and fix them to something? This is at the heart of The Chimes. There are myriad books about one person’s memory loss or lapse or selective nature, a few concerning a prodigious capacity even. I’m hard-pressed to recall one that deals with mass memory in such a striking and inventive, even audacious manner. Imagine a world where you can’t recall from one day to the next, where your very survival depends on starting work young enough to instil in your body the sense of your vocation. There’s a scene early on where Simon meets a boy on a hill and the sense of fear, of the desire to comfort and the cruelty of survival is palpable. We’d call it muscle memory, yet how right it is that the author freights the idea so with that term bodymemory. So vital, so deeply ingrained it won’t be lost. It’s the lightest touch but so crucial. That awareness of language comes through time and again. Music is central, indeed pivotal in the world Anna Smaill has created and the way she incorporates that into the everyday telling of the story is superb. I’m in danger of throwing far too many big names around but I was reminded of Bernard MacLaverty’s Grace Notes, and in particular Herman Hesse’s The Glass Bead Game. This latter was a particularly strong association. That notion of art elevated to the very highest form it can attain; the devotion of those in whose hands this art is held; the reverence with which it is treated by everyone. Very early into the reading I wondered which instrument(s) Anna actually plays. Aside from the lento, piano, forte instructions you may recognise from sheet music, there are some more technical inflections around scale and harmony too, even the solfege instructions before the opening page that, if you know the theory, will deepen your reading. And I’m stepping lightly now as I don’t want to give anything away, but the wider aspects of the world of The Chimes are handled with equal subtlety. At the centre of most dystopian novels is a wielding of power that must be opposed in some way. What Anna Smaill also gives us is the other side of that coin, the widespread acceptance, even the comfort gained from embracing that control. After all, in such a world who could possibly imagine what would replace the prevailing power if it should fall? If you’re thinking it’s all starting to sound a little heavy, fear not. This book is, I think, one of those rare beasts where the plot, the characters, the language is all in balance. There’s never a word spoken that rings false, there’s never a turn taken that leads nowhere and there’s no dead weight in the list of people we encounter. This is the first book I’ve read this year and I’m already thinking it’s going to have to be a pretty amazing year of reading for this not to feature in my highlights come December. It’s always good when you discover a book that makes you think. I can safely say it’s been a while since a book made me think about so many different things. Ask me what The Chimes is about and I might say social control, or perhaps the importance and function of memory, or history or why we have stories, even. It spoke to me about all these things, and more besides. It sounds heavy, but I’d have no hesitation recommending this to an avid young teenage reader (and will likely be telling everyone I know to read it). As for book groups, it’s tailor-made, able to prompt a broad range of discussion points. Just make sure you allow some extra time to get through them all! My thanks to BookBridgr and Hodder & Stoughton for allowing me to read The Chimes. Tags: "Anna Smaill", "book review", "Books", "review", "The Chimes"
What a great year of reading it was! If you don’t know my method, I post about all the books I read. I try to tell you what I liked about those books. If I didn’t like it, I’ll simply post a ‘sorry’ (life’s too short, and the effort of writing a book too great to waste our time shooting them down). If I remember correctly, there were only 3 ‘sorry’ posts last year, and just one of those was a book I failed to finish. I can’t help but acknowledge the Curtis Brown Book Group, who supplied a consistently high level of books through the year. I didn’t get on with every choice but it says a lot that seven of the books they supplied made the cut for consideration in my top reads of the year. When you throw into that mix the fact that we Book Group members got to chat online with the authors it makes for a very special experience (Agencies, publishers take note: it’s a great way to get your books – and your companies – talked about!). So I start with a very special thank you to Curtis Brown’s Richard and Emma for inviting me to join, and all the hard work they put into making the group work so well. Chapeau! I’d also like mention BookBridgr here, who have put me in touch with some publicists and their new releases. Bloggers, if you’ve not yet found BookBridgr check it out. It’s a great resource. My reading for the year divided into a 60/40 split gender-wise, with 60% by women. Only 10% of my reading came from ‘non-white’ writers (quotes due to my very unscientific decision-making over the white or non-white question). I say only because it feels low and I think a conscious effort to get a little more diversity in this year won’t go amiss. Diversity is about more than ethnicity and there is one very special book that I’d like to mention. Though it made the cut for my top reads of the year I’m mentioning it here because it deserves the space (a debut novel from a small press on a subject about which awareness is growing). That book is Anne Goodwin’s Sugar And Snails. This is the book that made me think about that phrase, ‘reading outside your comfort zone’. It’s also one of the books I spent a lot of time thinking about after I’d finished it. Find it, read it, talk about it. And so we come to my top five reads in 2015. It could easily have been a top ten (and then a top 7 when I’d managed to whittle a little further) but life is too short to try and get down to a top 3. When I’m ruling out Life After Life, The Girl In The Red Coat, Galina Petrovna, The Good Son and Where’d You Go, Bernadette you’ll know how hard it was to come to a final decision! But here they are, in the order I read them. Back in January the first of our books for the Curtis Brown Book Group arrived, and what a book it is! Antonia Honeywell’s The Ship set a very high bar. It’s testament to the power not only of the story itself but of Antonia’s writing and her irrepressible protagonist that a year later the experience is still quite vivid. In February I was delighted to receive a copy of Harraga by Boualem Sansal (translated by Frank Wynne). If ever you needed an advertisement for broadening your reading horizons and picking up translations Harraga would fit the bill. It’s such a beautiful rambling conversation of a book, and the translation feels invisible, such is the immediacy of the main character’s voice. I’d missed Evie Wyld’s All The Birds, Singing on initial publication and made one of those promises to get to it ‘soon’. In March I made a trip to the library ahead of an event at Dulwich Books. Thinking I was late I ended up asking Evie, chatting with mates outside, whether the event was open yet. At least it stopped me gushing at her about how good I thought her novel was! To the library again in June, attracted by a lovely cover I spied through the window. I remembered it from The Literary Sofa’s Hot Picks (in fact four of my top five appear either in Isabel’s Hot Picks for 2015 or Summer Reads). Crooked Heart by Lissa Evans took me back to the Second World War (I think the most-visited place in the books I read this year) and brought me some of the most vivid characters I’ve met. It’s also a book that carries its heartbreak with dignity and shades of humour. The Second World War again in October, though in Italy rather than England. Look at the cover of Early One Morning and it gives you a good hint as to what lies inside the covers. Something quiet and a little mysterious, yes, but something that begs to be explored. Something beautiful. Yes, this is one of those books that I would say is beautifully written. It’s a simple premise underpinned by flawless characterisation, and it too is heartbreaking yet dignified. You could almost read it in a whisper. It strikes me there are two things particularly that these books all share: they all had fantastic, stylish and entirely pertinent covers; and in each case the story lives on after the last words have been read. More than the wilful dangling of a loose thread, that incompleteness acts as a sort of reflector on what you’ve read and invites, even taunts you to speculate over what might have followed. If you haven’t yet read them I invite you to give them a try. I think they’re worth seeking out and I hope you will too. Tags: "All the Birds, "Antonia Honeywell", "book reviews", "Boualem Sansal", "Crooked Heart", "Early One Morning", "Evie Wyld", "Frank Wynne", "Harraga", "Lissa Evans", "The Ship", "Van Demal" "Book Review" "review", "Virginia Bailey", "Virginia Baily", reading, Singing"